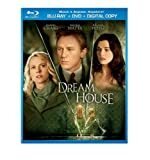 Dream House DVD and Blu-ray release date was set for January 31, 2012. Will Atenton moves his wife and two daughters from a flashy city to an idyllic house in New England. As they settle into their new lives, they discover that the house has a terrifying past. A mother and two daughters were murdered in the home, and the suspected killer was the husband and father, Peter Ward. Ward has recently been released from a psychiatric hospital, just as frightening things begin happening to the Atenton family. Will and his new neighbor Ann Paterson begin to investigate the story and unravel the scary history of the man who used to live in the house and the grisly history of the house itself.